The number of people in King County who left homelessness for permanent housing has nearly doubled since 2012, but the overall tally of people who became homeless has risen more steeply — to nearly 30,000 in 2016. 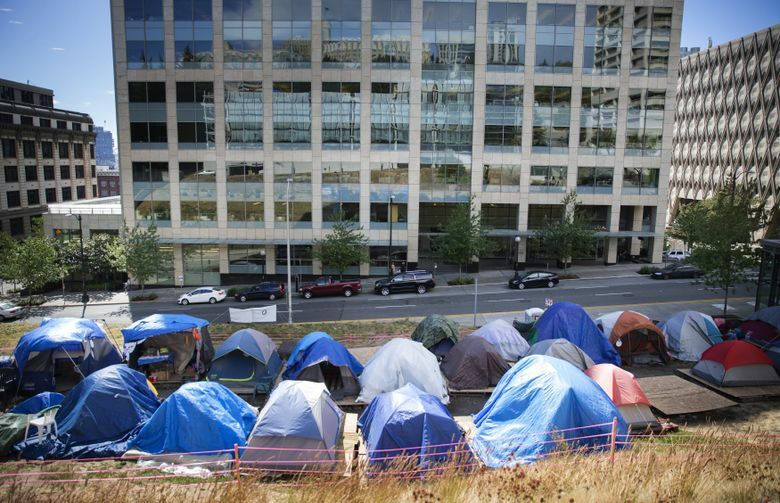 That data, from King County, framed the launch on Monday of a sprawling new regional task force on homelessness to stop the descent of many into abject poverty. The 75-member group, called One Table, is the first evidence of regional collaboration between new Seattle Mayor Jenny Durkan and King County Executive Dow Constantine on the homelessness crisis. The mission of the task force remains fuzzy — with a stated goal of finding solutions to “root causes,” including a lack of affordable housing and gaps in the behavioral health, criminal justice and child welfare systems that jettison people directly into homelessness. At a news conference after the first meeting, Constantine said the task force was in response to a city property tax proposed, then withdrawn, last year by former Seattle Mayor Ed Murray for homeless services. One Table, co-chaired by Auburn Mayor Nancy Backus, includes leaders from a business community that has objected to a rising tax level. But Constantine suggested its recommendations could include new taxes for homelessness prevention. “We’re spending a lot of money now on crisis response (to homelessness), but on the prevention side, on the root causes, there is clearly still a gap in the resources available,” he said. She also voiced a now-familiar criticism of the regional governance model for homeless services. King County has a homelessness coordinating board, called All Home, but it lacks independent budgeting authority, and it has no central role in integrating $34 million in Seattle’s homeless spending with King County’s mental health, chemical dependency and criminal justice services. “We have to be more efficient. The way we’re doing things now is too fractured,” said Durkan. Data presented at the meeting showed the scope of the problem — a steep rise from 16,502 entered in 2012 to 29,462 in 2016 in the number of people entered into King County’s Homeless Management Information System (HMIS). That database is broader than the annual Point In Time snapshot of homelessness, and includes people who are briefly homeless. Year-end data for 2017 is expected by the end of the month. In 2016, nearly 25,000 left the HMIS database. About half of them went to permanent or temporary housing; the other half left for reasons not recorded in the database, but included people who got help from housing authorities or the federal Department of Veterans Affairs, or who went to jail, treatment or hospitals. To underscore the role of King County’s rising housing costs in the homeless crisis, charts showed a steep drop over the past decade in the number of units that rent for about $1,000 a month or less — and tripling of housing units higher in price. The One Table task force is expected to make recommendations by April.